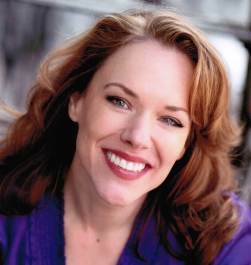 Tony Award nominated actress/singer and theatrical force of nature Emily Skinner is currently starring in the title role of Mame at Virginia Repertory Theatre in her hometown of Richmond VA. Emily is no stranger to Mame. She previously played the role of Gooch at Kennedy Center. On Broadway Emily originated the role of Mrs. Wilkinson in Billy Elliott and has also been seen in James Joyce’s The Dead, Jekyll and Hyde, The Full Monty, Dinner at Eight and of course as Daisy Hilton in the original production of Side Show. Along with Alice Ripley as Violet Hilton, Emily was nominated for a dual Best Actress in a Musical Tony Award for her work on that show. She was recently seen at Off-Broadway’s York Theatre Company in Inventing Mary Martin.Other off-Braodway credits include No Strings, Pardon my English, A Tree Grows in Brooklyn, and Fiorello at City Center Encores and in various productions and workshops at Manhattan Theatre Club, WPA Theatre, Paramount Theater at Madison Square Gardens, York Theatre, Playwrights Horizons and the Roundabout Theatre. While Emily has worked a lot on Broadway, she has an impressive list of regional credits. A few of them are Ghost Brothers of Darkland County at Alliance Theatre, The Little Mermaid at The MUNY and Lyric Theatre of Oklahoma, The Great American Mousical at Goodspeed’s Norma Terris Theatre (directed by Dame Julie Andrews), and locally you have seen her at Signature Theatre in The Witches of Eastwick and as Mae West in Dirty Blonde. A few other regional theatres Emily has graced the stage at include Long Wharf Theatre,Hangar Theatre, Bucks County Playhouse and Ford’s Theatre. Her many recordings include two cds with Alice Ripley (besides Side Show cast recording), Elegies for Angels, Punks and Raging Queens, Wall to Wall Sondheim and her self titled cd. I have seen Emily many times over the years starting with Side Show and then in James Joyce’s The Dead, Dirty Blonde and twice at Encores in No Strings and A Tree Grows in Brooklyn. This is on top of seeing her cabaret act twice at Kennedy Center and Signature Theatre. I started this column by saying Emily is a force of nature which means from the moment she steps onstage she holds you from beginning to end. Her voice is incredible and her talent is insane. Look at her credits and you see the range of characters has portrayed. With Mame at Virginia Repertory Theatre, Emily is home for the holidays. If you want a little brass and sass this holiday season, take a trip to Richmond VA and see Emily Skinner starring as one of the great female characters ever written for the theatre. The production runs through January 11th so plenty of time to “Open a New Window” and shout “It’s Today.” Emily Skinner, a giant talent that continues to delight and make us go WOW!! Growing up in Richmond, were you a part of your school productions? With the exception of elementary school (where I played the title role in Really Rosie), I actually spent my childhood doing shows outside of my actual schools. There was a great deal of wonderful professional theater in the Richmond, Virginia area growing up in the 70’s and 80’s and I was lucky enough to be adopted into the terrific theater community here at a very early age. Who were some of the Broadway composers you listened to growing up? Lucky for me, my mother had a vast Broadway Cast Album collection when I was growing up, and our excellent local public library also had a splendid collection of musical theater cast recordings, so I listened to everybody and every thing! I would say that I had an appreciation for both older composers and more contemporary composers equally. I have visceral memories of singing and dancing along to Oklahoma, Evita, Showboat, Jesus Christ Superstar and many others. I actually played my A Chorus Line cast album in such a repeated, obsessive way when I was around 10 (after having seen a national tour of it), that my father finally had to throw it out to give my poor family some relief. 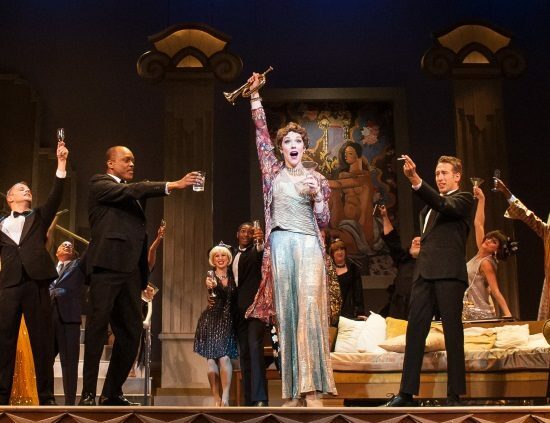 Emily Skinner and the company of Virginia Repertory Theatre’s production of Mame. Photo by Aaron Sutten. You have performed a wide range of musical roles in many regional theatres including Mae West in Dirty Blonde at Signature Theatre and Ursula in The Little Mermaid at The MUNY. Is there a dramatic role in a particular play you would like to play some day? You performed in Mame at Kennedy Center in the supporting role of Gooch. You have now moved up to the lead character in the Virginia Repertory Theatre production. Are there any other musicals that if given the chance you would like to play another role in? Hmmmm, well… having played Bianca in Kiss Me Kate years ago, I would love an actual crack at Kate in the same musical…! Does performing in your hometown add a little extra excitement each night? How could it not? I haven’t performed in a show here in over 20 years and its a total thrill to actually play Mame in the very same theater where I started my professional career in 1978 as Belinda in A Christmas Carol. Talk about coming crazy full circle! I literally get a lump in my throat every time I walk out for curtain call and see the audience standing up. I’m both profoundly moved and deeply grateful!